A lion in Kruger National Park pauses just as the sun breaks the horizon & lights his profile. My Africa series continues with South Africa. This is the country I first flew into, landing in Johannesburg (Jo’burg) only to immediately get lost driving my rental car through the sorts of neighborhoods where the world’s highest carjacking rates are. There I was actually stopping to ask groups of young men on the street for directions. Since I am writing this, you know I survived. I had planned to visit Kruger, one of the world’s most famous National Parks, straightaway. But instead I spent two months in Zambia, Malawi, Botswana & Zimbabwe. Now, with some experience under my belt, I returned to Jo’burg and prepared to head to Kruger. A baboon in Kruger National Park, South Africa, has an expressive face. I had arranged for reservations in the park, ahead of time, through the Park’s website. At Kruger Park’s camps, one has the choice of a nice but simple room or chalet, and a campsite. For the former, reservations are necessary. For the latter, it is not strictly necessary during the quieter periods. I visited during a slower period, but still found plenty of other people, especially compared to some of the parks I had already been to (Kafue, Nyika, Hwange). With this park, it is very wise to not visit during a busy period, which includes the height of summer (their winter) in July/August, nearly all of December, and other holiday weeks besides. Check South Africa’s school and government holiday schedule on the web. Many tourists fly in to the airport near the Park where they are picked up for their stay at one of the private lodges in Kruger or one of its satellite reserves (Sabi Sands, etc.). But I am firmly in the budget traveler category, so I rented a car at Jo’burg airport, piled my stuff inside (including my well-used pup tent) and headed out. Note that Kruger’s roads are generally excellent and do not require a 4×4. A simple sedan will do, and they are relatively cheap. Also note that drivers in South Africa do not like to travel at less than 90 mph unless they are forced to. Be prepared to put the pedal to the metal or get good at pulling aside to let them pass. After spending the night at a little B&B in Malelane just outside the southern gate of the same name. Although I was told I needed reservations before I showed up at the gate, the truth is you can get the staff at the entrance to set you up at a camp if you arrive with few plans. Just make sure, once again, that it’s not during a holiday period. I drove right into the park, took the first turn toward the west, a well-graded gravel road, and began right away to see animals. I saw a baby giraffe, a white rhino with her baby (image below), elephant and more. I was stunned at the diversity. Another thing I didn’t expect was the beauty and diversity of Kruger’s landscapes. The southwestern corner, around the excellent Berg en Dal Camp, is hilly and rocky, with gorgeous landscapes. I continued to explore the southern part of Kruger over the next 6 days. I stayed at Skukuza, Lower Sabie & Satara Camps, plus visited Oliphants. I liked Skukuza (for animals) and Berg en Dal the best. I wished I would have stayed at Oliphants – it is perched spectacularly on a high hill. Satara is a nice big camp as well. Lower Sabie really squeezes their campers in. I rose very early every morning, and was out on a game drive by 5 a.m. at latest. One morning, from Lower Sabie Camp, I was the first car out when they opened the gate. Shortly a few vehicles started following me (I go slower than most), so I impulsively turned onto an empty road. Nobody else followed, and I kept going as the dim dusk light gradually improved. Then I saw something in the road ahead. It looked at first like small boulders lying there, but there were no cliffs around – flat as a pancake in fact. As I got closer I realized I was looking at a dozen or so lions just lying in the road, all females and youngsters. I stopped a hundred meters from them, but they had heard me. A big female was the first to rise, quite reluctantly, with a lot of stretching and yawning. She then took a long pee, forming a lake on the pavement. The others slowly followed, the babies very cute as they yawned. I drew closer. The sun was breaking the horizon, but I was unable to get the photos I really wanted, as they were rapidly melting back into the bush. Now I turned and noticed a couple other cars had showed up. Beyond them, I saw a big male sauntering down the road. I waited and he passed within a few feet of me, pausing briefly as the sun cleared the horizon and cast a golden light on him. He gazed at me briefly, then continued his slow pursuit of his pride. He was majestic, and I a nice portrait of him (above). Note that these photographs are available for licensing via download, or purchase as framed or matted prints. If you click on one of the images, it will usually take you to my website, where you can make a purchase. If you click an image that does not take you to my site, you are welcome to download that image for personal use only. Thanks very much for your respect and interest. Near Skukuza Camp, there are several kopjes, which are large rocky outcrops that stand up above the surrounding bush. One such kopje was the site of my first leopard sighting in Africa, and it was special. I was alone at the base of the rocks as dusk deepened. I was really pushing it, since at Kruger it is illegal to be outside the camps after sunset. It was the type of environment where you cannot help but think of leopards: plenty of rocky hiding places amongst the large granite monoliths. I was just about to give up and race back before they closed the camp gate when a leopard just trotted up the dirt road. I watched as he gracefully probed the forest near the road for prey, his long tail waving in the air above him. He was the most gorgeous animal I had ever seen. My picture was not the best, because of low light, but it means a lot to me. 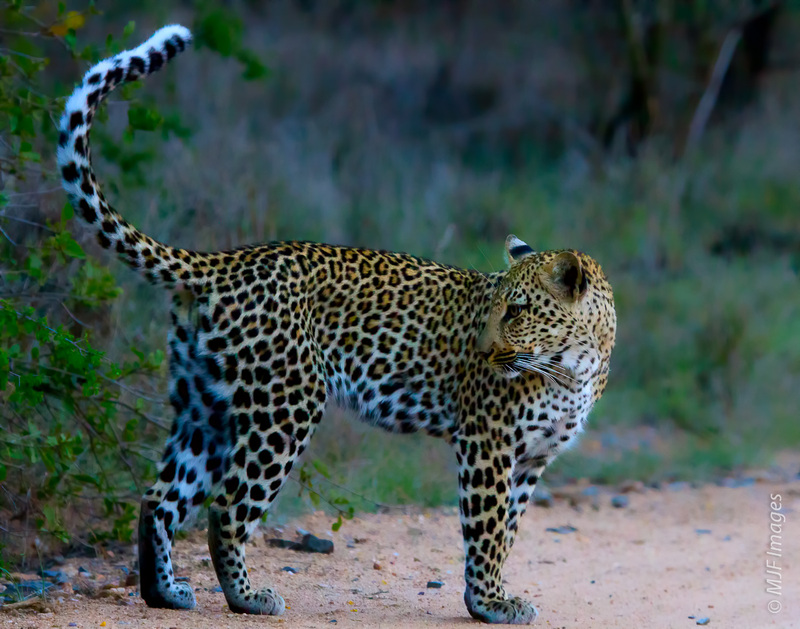 A leopard stalks the bushveld in the early evening at Kruger National Park, South Africa. A lioness stalks impala (who are unaware of her) in Kruger National Park, South Africa. This spot became my lucky kopje. Next morning early, I was once again alone, very near where I had spotted the leopard the previous night, when I felt a strong urge to stop and wait. As I backed into position near an opening in the bush, a lioness abruptly rose from right beside the dirt road, only a few meters from me. I had passed without noticing her crouching there. Lions blend in so well with the tan grass of the bush. She proceeded to stalk some impala who were clustered in trees just below us. I watched for a good 40 minutes until a couple other cars showed up. As I pulled away, I was happy that my normal routine of late-sleeping night-owl had been turned on its head in Africa. The early bird gets the wildlife sightings. I saw much more at Kruger, all of the Big Five several times over. (The Big Five are Elephant, Buffalo, Lion, Rhino, and Leopard.) But those experiences at the kopje were probably the most memorable. I also took a night drive, which I highly recommend. Guides working at Kruger are extremely professional and good at what they do. You are not allowed to do night drives on your own, and lions, wild dog, and other animals are much more active at night. They often use the roadways as trails at night. Many other animals (such as the honey badger and civet) you will only see at night. Later, near the southern part of the park on a dirt road, I saw the rare black rhino, two in fact. These are MUCH less common than white rhinos, and the two species’ behavior differences are much greater than their physical ones. If you are charged by a rhino, it will most likely be a black rhino. One of the pair I saw, in fact, made as to approach me, trotting a few paces before just staring at me. Later, as I lay on the road (illegally – you are not supposed to get out of your vehicle at Kruger), trying to photograph a dung beetle busily rolling his dung ball, I looked up to see my friend the rhino, this time alone. As he walked down the road toward my vehicle, I walked (quickly, trying not to run) toward him to beat him to my car. I made it with room to spare, but he had definitely caught my scent. I crossed out of Kruger on a bridge over the Crocodile River, after a memorable week in this beautiful park. On my way to Swaziland (the “kingdom within a country”), I stopped on the bridge and watched (what else?) a large croc basking on some rocks below. I recalled being told by experienced Africa travelers that Kruger was too touristy and developed a park to be worth a visit. You will definitely see more cars and other tourists in Kruger than you will in, say, Kafue N.P. in Zambia. But Kruger’s beautiful landscapes, its diversity of wildlife, and its sheer size (I only saw a fraction of the park in one week) make it a very worthwhile destination. And to seal the deal, it offers all of this at a relatively cheap price. Take the dirt roads, get up very early, nap in the afternoon, and stay out until the gates close. You will see all of the African wildlife of your dreams, from big and mean loners (below) to cute families (bottom). A black rhino approaches for a closer look in South Africa’s Kruger National park. A family of vervet monkeys stick together in Kruger National Park, South Africa.